No matter where you live across the region, you can count on Parkview hospitals for emergency care 24 hours a day, 365 days a year. At each of our hospitals, the emergency department is staffed ‘round-the-clock by expert emergency care physicians and nursing professionals who are trained and experienced in emergency care. Remember, when a life-threatening emergency occurs, always call 911 right away. If the emergency is not life-threatening, have someone take you to the nearest hospital emergency department so you can receive medical attention as soon as possible. Because the first hour after an emergency is the most critical, Parkview’s two Samaritan helicopters – with crews trained in advanced life support (ALS) and advanced on-board trauma technology – are always standing by to provide rapid air transport for critically ill or injured patients. Samaritan 1 is based in Fort Wayne at Parkview Regional Medical Center; Samaritan 2 is based at Fulton County Airport in Rochester, Ind. Both medical helicopters are called into action by the Parkview EMS dispatch system, and can respond to emergencies in a 100-mile radius of the two communities. For residents of northern Indiana, northwest Ohio and southwest Michigan, Samaritan is a familiar presence in the skies. Since 1989, Samaritan helicopter crews have flown more than 20,400 patients who needed critical medical assistance. In addition, the dedicated emergency medical response professionals who staff 23 ambulances across the Parkview Health system are always on alert to provide care when emergencies occur. No matter whether you live in Topeka, Bippus or Hoagland, Parkview EMS services are only minutes away. Just for fun, print out this coloring page. Click ‘here’ to meet all of the Samaritan friends and learn about the crew members they work with! 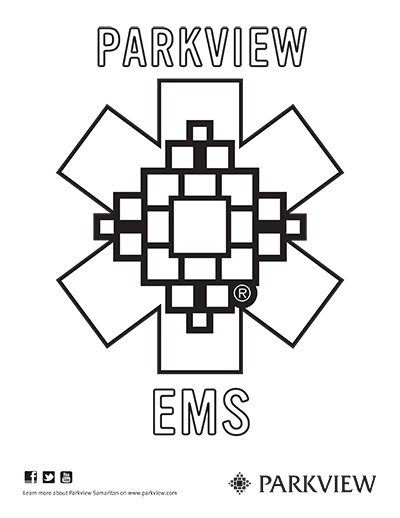 All members of Parkview EMS in Huntington, LaGrange, Noble and Whitley counties wear this badge on their uniforms.